When baseball fans dream of warm summer nights at the ballpark, they may remember fireworks, hot dogs and foul balls. In Columbia, starting next April, they'll throw in the glowing nostalgia of fireflies. On Tuesday, Hardball Capital CEO and chairman Jason Freier revealed the name and logos for the new Minor League team coming to South Carolina in 2016: the Columbia Fireflies. The Class A team will feature a blue and yellow logo of a firefly, with alternate marks incorporating the familiar glowing of the insects and the childhood tradition of capturing those mysterious lightning bugs in a jar. "Most kids have gone out in the backyard with a mason jar and tried to catch some fireflies," Freier said on Monday ahead of the announcement. "That's another thing we can extend around the ballpark." Freier, who also helped rebrand the Fort Wayne TinCaps, has led the way in creating the look for the new South Atlantic League team, which will relocate from Savannah, Georgia, for next season. The Fireflies name not only evokes thoughts of relaxing summer evenings but also gives a nod to the heat that Columbia, South Carolina, is known for. "The primary logo is an iconic representation of the firefly," said Freier. "We've got the silver wings, we have a luminous neon flame at the base of the abdomen. The emphasis of the 'fire' part of 'fireflies' points to one of the things Columbia is known for -- the heat. Columbia's slogan is 'Famously Hot,' so that's the primary reason." The Fireflies will debut at home on April 14, 2016, at Spirit Communications Park. The ownership group, which also runs the Fort Wayne TinCaps, gathered name suggestions from fans, their design partner, Sky Design, and from internal suggestions over the last year. Freier, who announced the name in a press conference Tuesday, said the team leaned early on toward Fireflies, which was suggested by several fans as well. He said the team received name suggestions from about 2,300 fans and then worked closely with Sky Design to create a logo and brand for the new club. "There were long internal discussions, whittling the list of names down to the ones we were comfortable with. Early on in the process, we started to feel like we had the right name, and at that point it was just checking it and working on it more than it was making a decision," Freier said. "Plenty of other names could have made fine team names, but we liked where this would go with the colors -- we think they're cool colors," Freier continued. "In addition to the name being unique in Minor League Baseball and regionally, the colors we have chosen are not like any of the teams in the area around Columbia -- none of the college or pro teams use colors like this. In lots of ways, every box we're trying to check, this did it." Fireflies, also known as lightning bugs, are actually beetles that produce a glowing yellow light or bioluminescence during twilight to attract mates or prey. There are more than 2,000 species of fireflies, including some on the West Coast of the U.S. that don't produce light, so fans from other parts of the country may not be completely familiar with the magic of lightning bugs. They're typically found around marshes or in wet, wooded areas in summer. 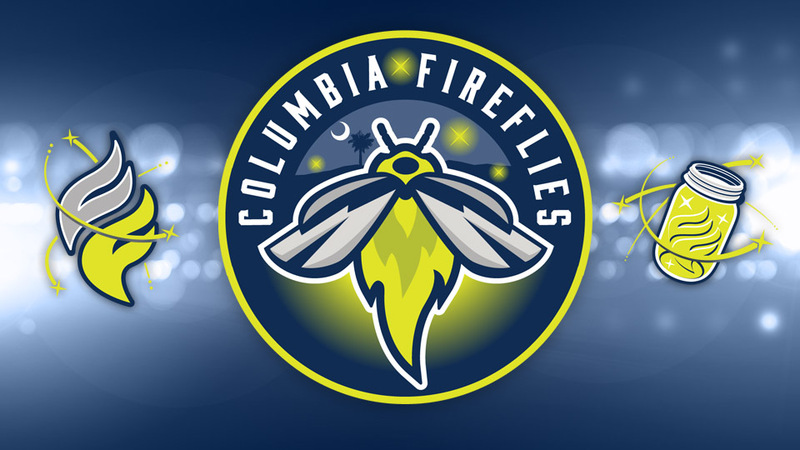 The Fireflies' primary logo depicts the iconic insect glowing under the moon in a dark blue night sky (a representaiton of the South Carolina state flag). 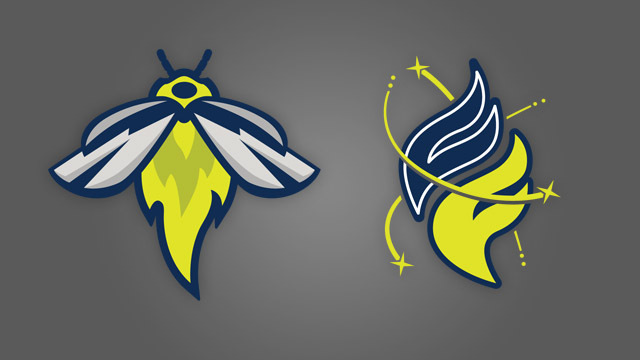 Secondary logos use the stylized initials of the team, C and F, to form a flame encircled by streaking fireflies. A third logo is a mason jar with the alternate logo inside, also surrounded by sparking bugs. Freier said the team will reveal its uniforms in September. Another twist? The Fireflies hats will be glow-in-the-dark, joining the Sally League rival Asheville Tourists, whose cap has a moon that glows as the only clubs in the Minors with that feature. Famously, the Casper Ghosts wore glowing caps before moving to Grand Junction, Colorado, and becoming the Rockies after the 2011 season. "I had seen that years ago [with Casper] and thought that was pretty cool," Freier said. "We never tried to make the TinCaps hat glow, but here it just sort of fits. And the mason jar has that flame formed by the C and the F inside the jar, lit up by the fireflies, and streaks of light encircling the jar -- mason jars just have those positive associations." Freier said the Fireflies name is based on local ties -- in the nearby Congaree National Park, one particular species of fireflies, Photinus carolinus, gathers every year and lights up the night in mass synchronization. Scientists aren't even sure why these specific fireflies exhibit this synchronized behavior, but the organized bioluminescence has attracted tourists and locals to the park to see the phenomenon. "It's highly unusual -- people come out to see that light show," said Freier. "[The synchronization is] a pretty cool and unique thing, and all these flies getting together as one was a good metaphor for the city of Columbia and its people. That was the primary motivation for choosing the name." Freier said the team will focus on keeping the team's brand visible throughout the new stadium, something he's perfected in Fort Wayne. Like a casual summer evening barbecue, he hopes to illuminate parts of the ballpark with hanging mason jar pendant lights. The "fire" aspect of the name will be reflected in hot, spicy concession items as well, in addition to glowing cap logos. Though many Minor League teams turn to Brandiose and Studio Simon for logos, Freier said the team went back to Sky Design, a firm that also has done work for the Atlanta Braves and Atlanta Falcons. "Look-wise, we wanted something a little different from what other teams in Minor League Baseball are using," he said. "We have a long-standing relationship there. Fort Wayne's branding couldn't have been much more successful,"
But speaking of Fort Wayne, Freier admitted that when his group renamed the club there in 2009, it faced an immediate backlash from fans and even local businesses about the TinCaps name. He said his team is prepared for the public's response, regardless of how positive it may be, especially in the wake of reactions to other recent Minor League teams in El Paso, Akron and Hartford. "We faced that same thing with the TinCaps, we had an apple with a pot on its head and people said, 'What on Earth are you doing?' We saw hundreds of comments on the news stories when the name was announced. If 10 percent were favorable, that was a lot," he laughed. "We had people on the radio talk shows saying we were crazy and this is a disaster. Business leaders reached out to us in a very sincere way trying to be helpful, they'd say, 'Hey, look you made a mistake -- maybe you should take a step back and really re-evaluate.' But we felt like we had the right brand, once people saw what we could do with it. We stayed the course, and that has been a tremendously successful brand." That experience perhaps influenced Hardball to lean toward less of a cartoonish logo and go with something more straightforward. "We explored some of the things that may have looked like other Minor League logos that would have looked like more of a character than an icon. This is more iconic and less than a character," he said. "There isn't a face staring back at you. It's an iconic representation. You're not seeing legs or whatever. We took it down a few different paths before settling on the path we took to the logo you see." Freier also talked about the team's new ballpark, which is still in the initial phases of construction. "Things have gone very well, we've been lucky enough to experience favorable weather this summer. We've not had the crazy rain or storms you can sometimes get in the South. We remain on-schedule for our opening," he said. The group is also using lessons learned from Fort Wayne in building a smarter facility in Columbia. Freier said he expects the stadium will attract more investment into the area, too. "This will be a major revitalization project on a scope that -- in Fort Wayne, we have about $250 million in development within a few blocks of the ballpark -- in Columbia, we're hoping to have a multiple of that. It's an enormous opportunity."